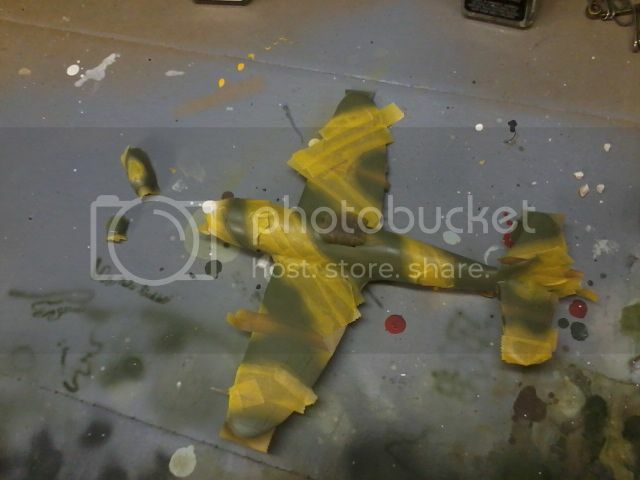 Torsten, you have applied a beautiful olive drab, I can imagine how nice it will look with all the stencils. I see that dammed typo too late to fix. Well anyway they are very tiny. construction goes quickly. The Platz kits are extremely well engineered. the surface detail is beautiful, and the fit up is absolutely perfect. There is no discussion of filling gaps or hiding seams. they simply disappear. 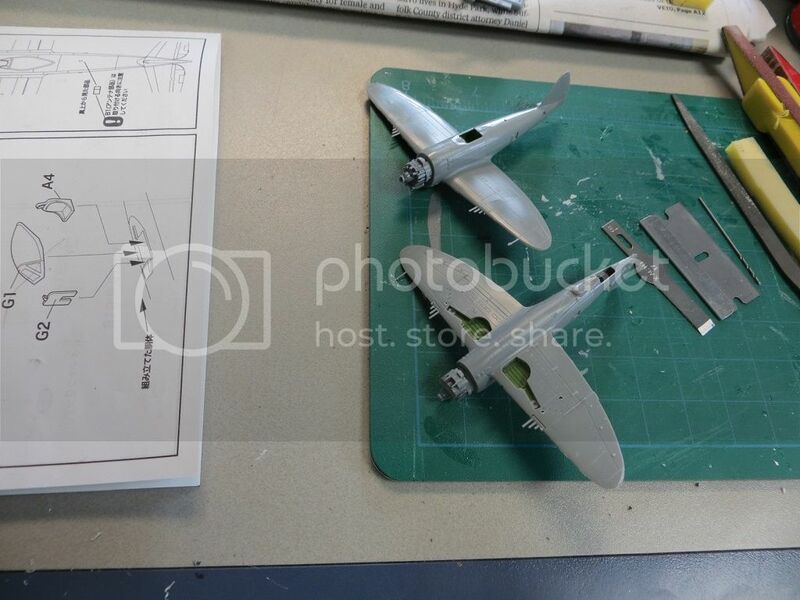 If someone was interested in starting in 1/144, I would suggest any Platz kit first. I call this beauty ready for take off, guys! 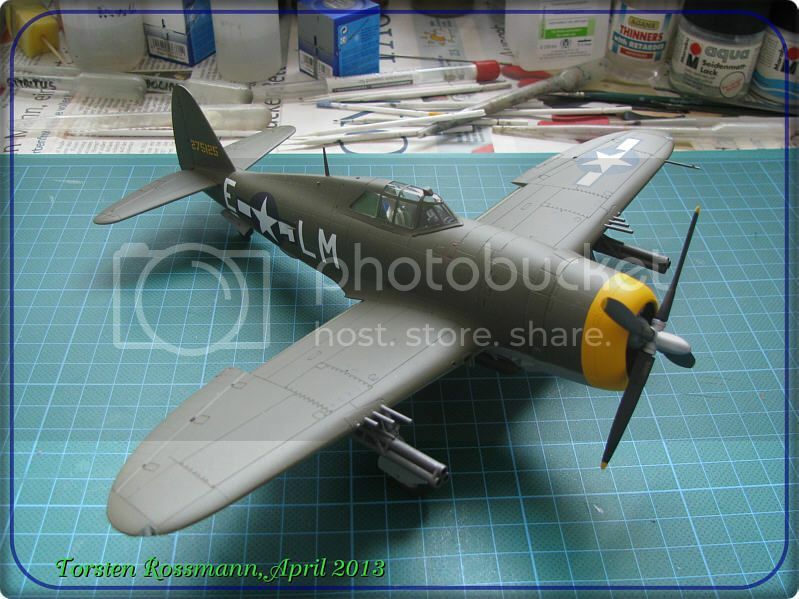 Thats a Cool Looking P-47 I Hope mine looks half as good when its done. Yes indeed Torsten, that is super. the yellow parts with the olive is very handsome. I have applied the gloss black base coat for the Alclad metal paint, which I have to mail order this week. Actually three campaigns underway at once here, The Dornier 228 is a HangerQueen. 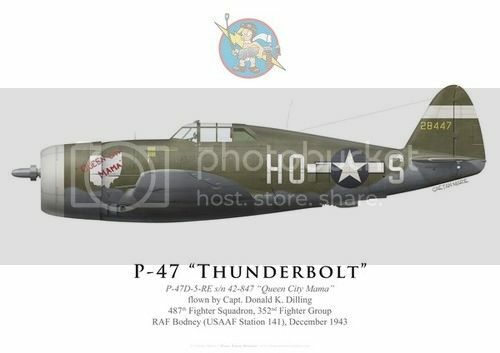 Looks like I will be building "Angels Playmate" in 1/32. 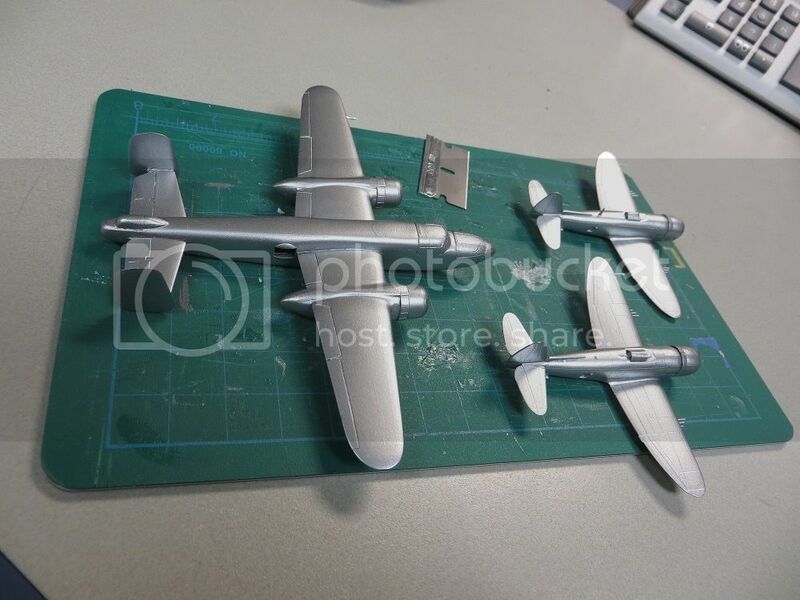 I will be using the Tamiya P-51 with the above Kagero decals, Barracuda placards and wheels. Haven't got any more done on the Hasegawa Jug I'm afraid. But I've been crawling along at a glacial pace on a Tamiya Razorback. Finshed painting the underside star and bars on tonight. I'm making an effort to get at least 30 minutes benctime in every night if I can. New member of the group and very happy to be here! I'll set up a build log in a few minutes. Are there rules as to topic naming? There are no rules to topic naming on blogs here, and you don't need to set up a blog for this Group Build. You are welcome to post your progress in this thread. 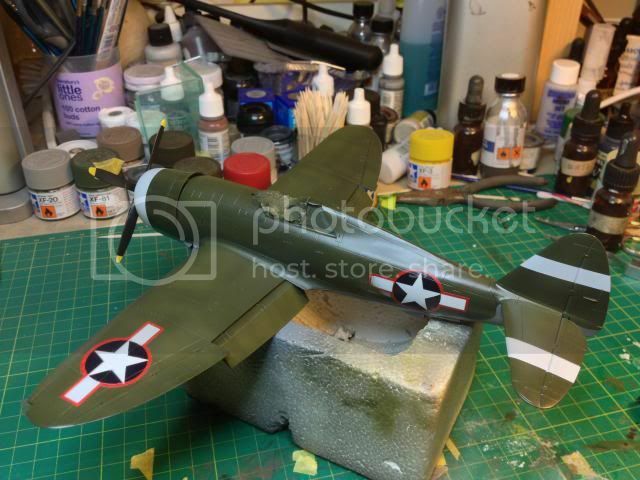 What kit/scheme are you going to build? Nige, great to see you getting some bench time, keep at it mate! 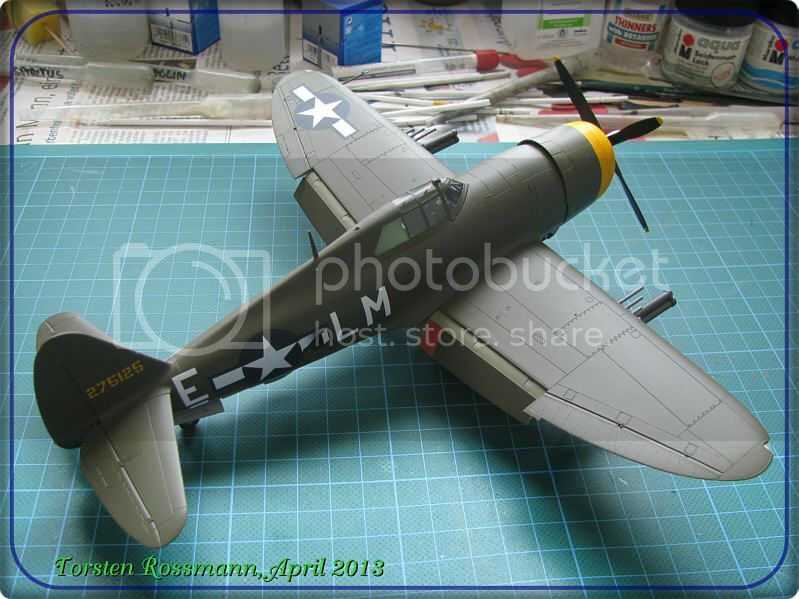 Torsten, beautiful build, very nicely done. Jonathan, cool little production line you have going on! Its been months since I touched the Razorback with a Regional contest to prepare for, several IPMS review builds, family, work, other hobbies and I was just not keen on the Otaki Jug. (Not to mention getting ready for the AMPS nationals and about 1/2 dozen other kits on the bench.) The fit of the Otaki is decent but detail is week and the shape just doesn't look right to me. 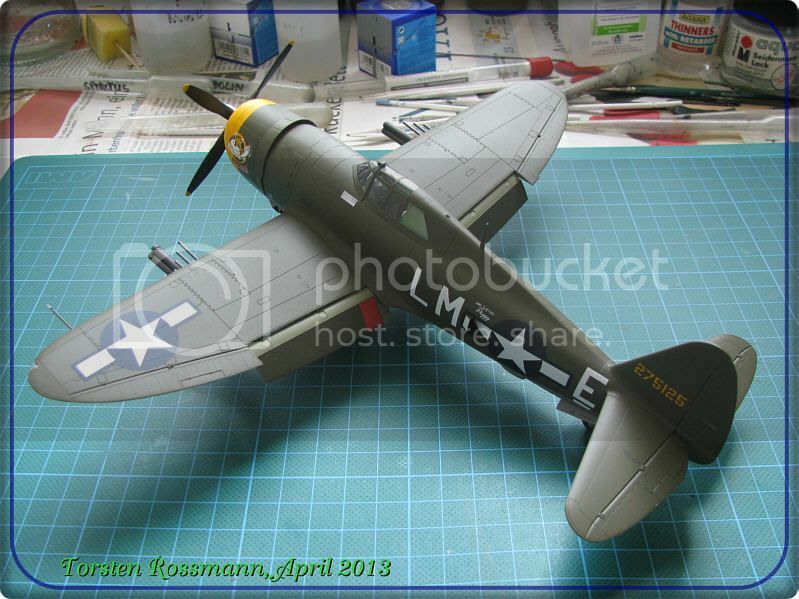 I had planned on the Mrs Second Front jug but I couldn't get past using those nice decals on a kit I wasn't happy with. I finally decided a couple of days ago to dig into the decal stash and I pulled out a set of decals for the Queen City Mama. I like the look of QCM and being an Ohio native I thought this is the way to go. I was able to spray the neurtal grey this past week being home sick (really sick, not the normal mental health days) and just today the O.D. is on the top side. I'll let that dray a few days and then mask for hte white strips and bada bing its time for that ole' gloss coat. Last weekend I added some better photos of my T'bolt to my Assembly Line Thread. Have a look if you like, it's near the bottom of the page. Damian, is there a gallery for this group build where I can post 1 or 2 pics. I can't find any. 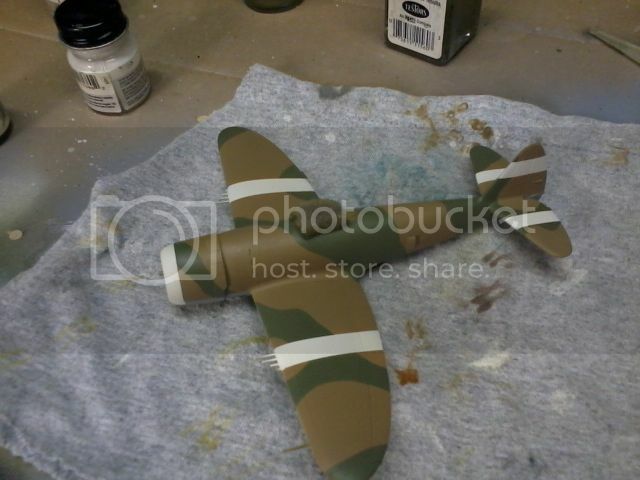 Progress on the Razorback with the national insignia painted on. Lots of touching up required, these red bordered star and bars were a real pig although it was my own making and not the masks. 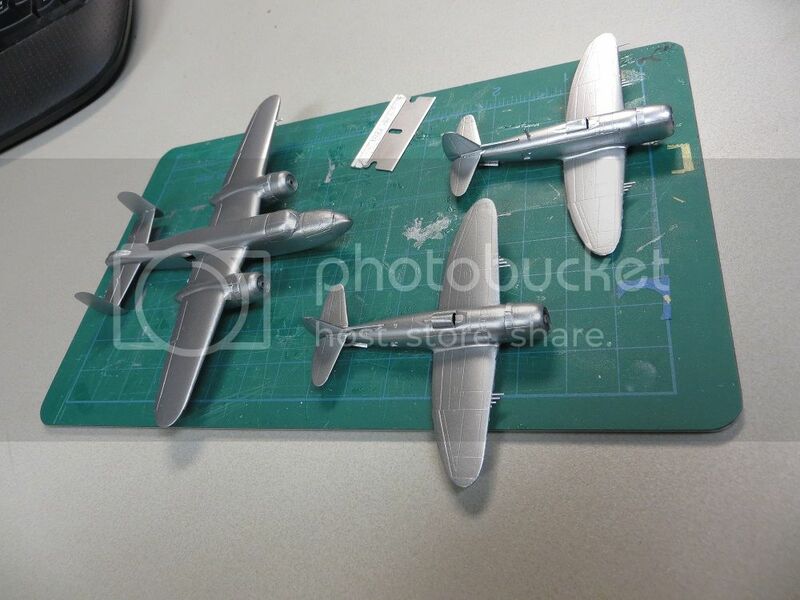 And even some progress on the 1:32 Hasegawa Bubbletop. 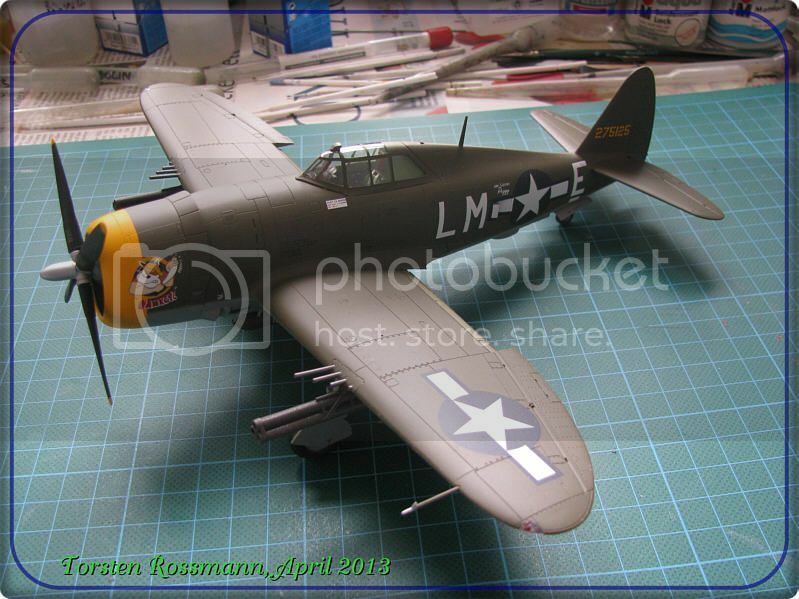 I have started to correct the kit cowl to a D-6. I haven't been around for a long time. Been building other wingy things. 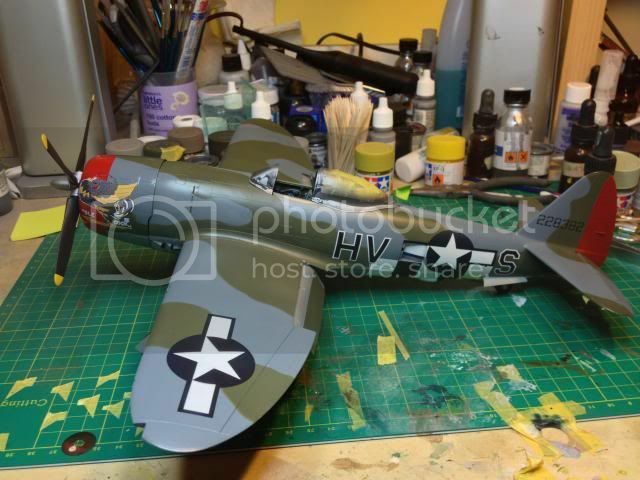 Anyway, I'd like to jump in here with A Tamiya Razorback in "Janny M" markings if I could. I just started her and have only glued a few things together. I found this thread while researching the markings. So, if it's ok to jump in with a started bird let me know. G'day Jim, and welcome aboard. You are welcome to join up with a "hangar queen" as a few others have. I look forward to seeing your progress, so please don't be shy about posting pics. Apologies to everybody else for my absence lately, real life has been crazy with work and my eldest daughters 21st birthday (man I feel old now!). Hopefully things will calm down somewhat now and I can get back to the workbench. Here's the markings I'm going to use. And here's the proof I actually did something. Great work Jim, you'll be done in no time at this rate! 3 day weekend for me starting today, so hopefully I can scrape together a couple of hours at the bench and break my recent drought here. yes, coming together nicely, Jim. Nice little ones there Jonathan. Looks like you got a smooth finish. I hadn't touched mine until today. Mom and the kids gave me all the bench time I wanted for Fathers Day. I worked on a slew of other projects too. It really is the simple pleasures that make things worth while isn't it. When I was a kid and had all the time in the world, I was never satisfied with anything. Now, more or less grown up, just a couple of hours here and there to myself for some bench time is awesome. Wow! I Didn't think Id be away from the bench that long. Work and life have been a bit taxing but hopefully I can keep this build going. 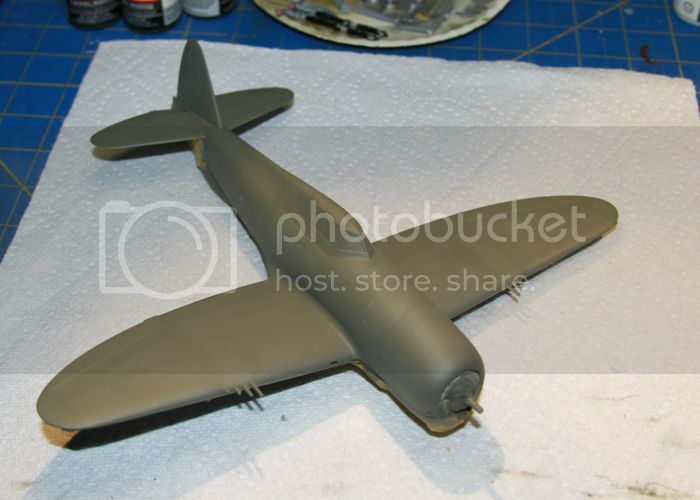 No pics this time but I have got the Dark Earth base coat on my SEAC bubble top and soon I should be starting the Dark Green camo. 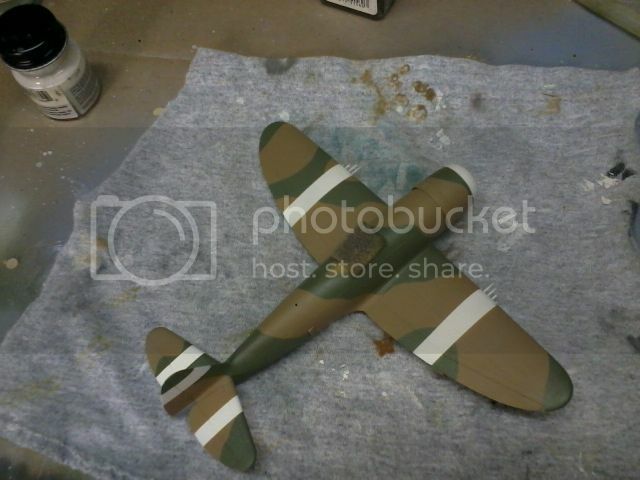 I was surprisingly productive today, getting the canopy and camo masked and sprayed dark green. I didnt get a warm and fuzzy feeling from the hasegawa instructions regarding the scheme and I didn't find any consistent patterns online so I deduced that perhaps the patterns weren't quite standard and cobbled one together in the spirit of progress. I masked the canpy with bare metal foil, which was a first for me, worked like a charm, Ill be doing this again for sure.